Dominic “Bud” Alessio, a long-time Quarter Horse owner and breeder who also served the industry as President of the Pacific Coast Quarter Horse Racing Association Board of Directors since 1993, passed away on Tuesday evening. He was 77. A businessman and head of a real estate investment firm in San Diego, Alessio was an active breeder and owner of Quarter Horses since 1979. 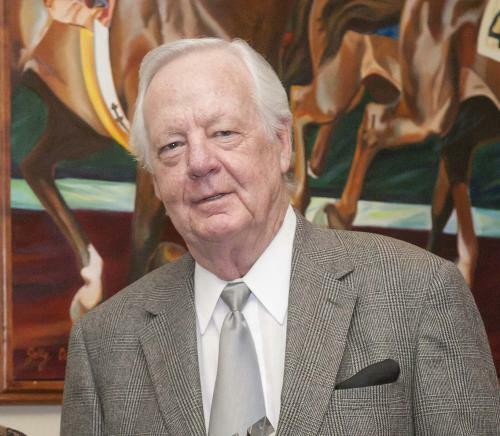 Previously, he was majority owner of Ruidoso Downs and Sunland Park racetracks in New Mexico from 1972 to 1978. He began his service to the Association in 1992 and was elected president the following year. Alessio represented PCQHRA and California as Honorary Vice-President of the AQHA. Under Alessio’s watch, the PCQHRA managed the successful Los Alamitos Equine Sale and introduced major Quarter Horse racing events like California Breeders Champions Night and the Ed Burke Million Futurity, both staples of the Los Alamitos Race Course year-round stakes program. He was also instrumental in assisting Los Alamitos Race Course and the California Horse Racing Board in finalizing the hair testing eligibility regulations in the State of California. His hands-on approach to directing the daily operations of the association played a key role in establishing financial stability for PCQHRA and developing a strong working relationship with Los Alamitos. Born October 8, 1941, Alessio had a lifelong involvement in horse racing. His father, John Alessio was a California entrepreneur who was one-time owner of the famous Hotel De Coronado. He was also executive director of Caliente Race Track in Tijuana from the late 1940s through the 1960s. John Alessio came up with the ‘5-10’ bet, the precursor of today’s Pick 6, and the ‘1,2,3’ bet or the Trifecta as it is known today. The younger Alessio spent many of his teenage years in the halls of Caliente Race Track and in his late teens worked at a race track his father helped build in Juarez, Mexico. Alessio’s family also operated greyhound tracks in Yuma, Apache Junction, Phoenix and Tucson. Alessio, his brothers, and brother-in-law would later own and operate Ruidoso Downs and Sunland Park. This ownership group was the overseer of the first All American Futurity that offered a $1 million purse, which was won by Moon Lark in 1978. The group would later sell Ruidoso Downs to the Ruidoso Jockey Club. After also selling Sunland Park, Dominic Alessio purchased his first racehorse under the banner of The Lucky 6 Corporation. His first two horses both became stakes performers, starting his involvement in Quarter Horse racing as both owner and breeder. In 1983, Thanks To Cute Bar was second in the Grade 1 Golden State Derby held at Bay Meadows and third in the Grade 1 Los Alamitos Derby. The Charles Bloomquist-trained Challenger Seven became his next horse and he was also a stakes runner. As his interests in Quarter Horse racing grew, Alessio became more involved with the PCQHRA and Los Alamitos Race Course. He had known the Vessels family for many years and become more and more familiar with racing stakeholders Ed Allred and R.D. Hubbard. It didn’t take long for the PCQHRA to become an important part of his life. After being elected president of the PCQHRA in 1993, Alessio made changes to make operating procedures more efficient. He made a deal to move the PCQHRA offices to the Los Alamitos Race Course grounds, making it more accessible for owners, trainers and track management. In co-operation with Los Alamitos Race Course, Alessio helped establish the California Breeders Champions Night, a state-bred championship night of races with over $1 million in purses. The Ed Burke Million Futurity was also established as a $1 million race in 2005, growing to as high as $1.1 million in 2008. For the Los Alamitos Equine Sale, Alessio was always a proponent for having all breeders represented at the sale. Alessio bred his mares exclusively to California stallions and campaigned his horses solely at Los Alamitos. More recently, Alessio’s stakes placed homebred gelding Ditto Head qualified to the 2017 Los Alamitos Two Million Futurity and participated in five other stakes races at Los Alamitos while racing for his Nom de Course, Fortuna Properties LLC. His 3-year-old winning filly Favorite Elise made her most recent start at Los Alamitos on Saturday, March 30. Both horses were trained by Mike Casselman. Dominic “Bud” Alessio will be long remembered for always assisting California's Quarter Horse racing industry. He is survived by his loving wife Katherine; their four children and their spouses: John Alessio and his wife, Sofia; Dominique and her husband, Steve Nielander; Elizabeth and her husband, Roger Norman; and Ashley and her husband, Edward Muncey; and a total of six grandchildren: Kate, Dominic, John, Michael, Paulina and Andrea. A private memorial service will be held on Friday, April 12. For more info, please call 714-820-2690.